It is a resounding joy for a Christian father to give away his daughter in marriage when the hands to which he passes hers belong to a man of God. I experienced that delight about a week ago when I gave my Emma to Destin Mahalik, her groom, and resolute believer in Christ. I can still remember the day Emma pulled my wife Lois and me aside to seek our counsel. “I feel like God wants me to pray for Destin Mahalik,” she said, “because he is going to be my husband. What is up with that?” Destin at the time was but a few months in from recovering from a serious drug addiction and a gunshot wound from a drug deal gone bad. While Emma was attracted to his new found zeal for the Lord, she also saw how much he had to mature before he was husband material. As for me, most would say that I should have objected, or tried to redirected her thoughts. But how do you object to praying for a man in need of prayer? On top of that, God has moved in my life to guide my path in ways that would make some theologians uncomfortable; those who do not believe that God speaks or leads his people in any direct fashion. And yet as I pondered Emma’s words, I bore witness that the Spirit of God was indeed at work and told my wife as much. “I would not be surprised if God did speak to her.” I said, “for he has often led me in a similar fashion.” So I instructed my daughter to pray for Destin and allow time to pass to test the rest of her impression. As for the story, I’ll let the video tell more. I marveled at the young groom’s faith. While we set up a contingency plan, we moved ahead and set up the reception under a large tent. With that, as each hour passed the percentages dropped. From sixty-five to forty, to twenty, then to nothing as puffy white clouds floated over us on a sea of blue sky. But the day was not without its trial. They say to expect at least one thing to go wrong at every wedding. This wedding was no exception, and all agree that the devil did what he could to thwart the plans. Emma decided the wedding party would travel for pictures at 10 am before the 1 o’clock wedding to save time. When Emma sat on the passenger side of her car, with her sister Martha driving she said, “Can you just drive slowly? I don’t want to have to put my seatbelt over the dress.” Martha (in fine nurse fashion) insisted she buckle up, to which Emma obliged. Minutes later, an errant driver attempted a sharp right turn from the passing lane and clipped them as they traveled 45 mph in the right lane just behind him in his blind spot. Their car spun, airbags deployed, tires burst and shards and fragments of their Toyota Camry scattered across the pavement. Emma remembers cautiously opening her eyes and looking down to see if she still had both hands and legs, and wondered if any blood had stained her wedding gown. Both arms and legs were there, right where God designed them to be. And her dress—as spotless and perfect as it was before the crash. 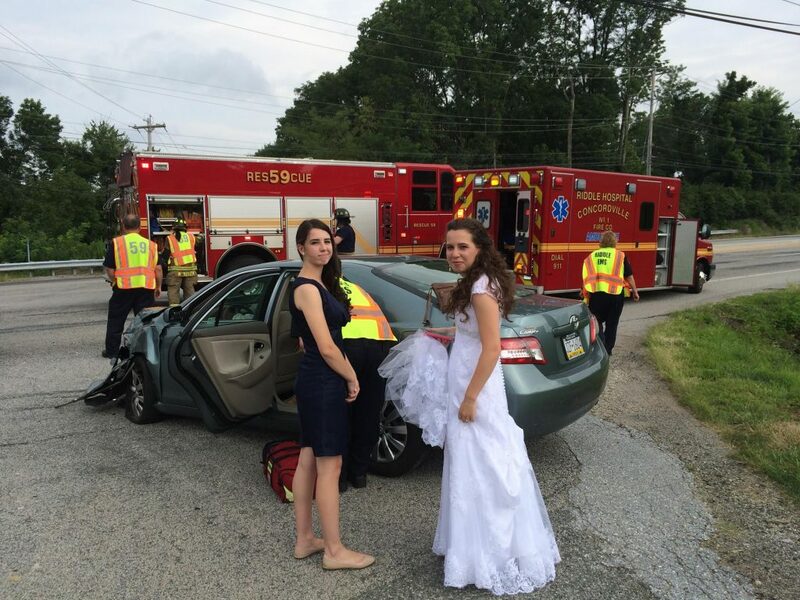 God protected them; no one was seriously injured in the crash, and Destin and Emma were married. To God be the glory! Was a beautiful day and awesome wedding… Martha’s face is priceless in that picture!! Congrats Emma and Destin so happy for you!! God is faithful! Destin and Emma are God honoring. Wow! What a beautiful, God gloryifying story and testimony they have together. Beautiful! So glad this was shared. May many turn to the Lord through their lives! What an amazing story. Thank you for sharing. It was truly an Amazing Wedding,so Glad no one was hurt in the Accident.God and my friend Carol Memmo brought Destin into my life and into your Church .My son was suffering from a drug addiction and was about to be released from jail,Carol had let me know of a man in her church that could talk to me and maybe help me and my son.Well sure enough Destin called me and prayed with me over the phone,he is truly a man of God.God Bless Destin and Emma. What a glorious story of the way God delights in doing things His way and drawing two people who no one else might put together. And of His ability to transform and conform and speak to us and direct us in the path He knows is best!! It is also another story of the family of God praying together and perseveringly for their prodigals and God delighting to hear and answer!! Once again we have tasted and seen that the Lord is good and takes what the enemy means for destruction and turns it for His glory!! An awesome God fulfilling His approval of this marriage!